Concrete artisans are adept at dovetailing different techniques to amplify the impact of their finished work. Bill Kulish, owner of Quintechs LLC in Wilmington, Del., had a once-in-a-lifetime opportunity last year to combine a couple of the special effects described in this feature (and a couple that aren't) in a highly personal kitchen counter. His Yorklyn, Del., client wanted to celebrate her victory over cancer and her joy in life by preserving mementos and treasures in a sculptural countertop. She invited loved ones to send her objects that meant something to them and to her. She compiled a collection that included petrified wood, a dog bone, ammonite, a fossil, marble pieces, a quarter, river stone, rocks from various backyards, shells, quartz, buttons, gemstones and a string of beads. Then, in a gesture of love and remembrance, she also asked Kulish to incorporate the ashes of her late husband, whose favorite room had been the kitchen, into the concrete mix. To create the counter, Kulish arranged hundreds of items in a melamine form. 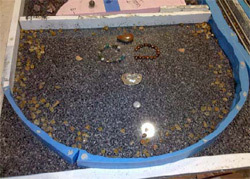 He added bits of tumbled glass and mirror and placed photoluminescent stones in the shape of the Little Dipper. With the objects in place he mixed concrete using a terra cotta liquid integral color from Elite Crete Systems. Since human ashes are carbon-based, they had little impact on the mix. He placed the concrete by hand around the mementos in the form. Then he took the remaining concrete, added a charcoal color, and hand-placed that around what he'd already done to create the look of darker currents running through the red. He added more black to the remaining mix and repeated the process. Once the concrete was cured Kulish added a vanilla scent (using the process described in this feature). Then the counter was ready for grinding and polishing. Here, Kulish says, his client was the risk-taker. He thought he was done polishing, but she urged him to keep going. Objects near the surface became near abstractions - "There's just a hint of the quarter," he says. 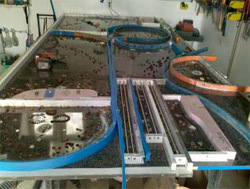 But the overall effect, a piece molded with a rock edge and polished to a burnt red, was just what the client wanted. Now at night the kitchen glows with the starlight of the Little Dipper and warm tea-light candles release the vanilla aroma. "It's a very spiritual experience," Kulish says. 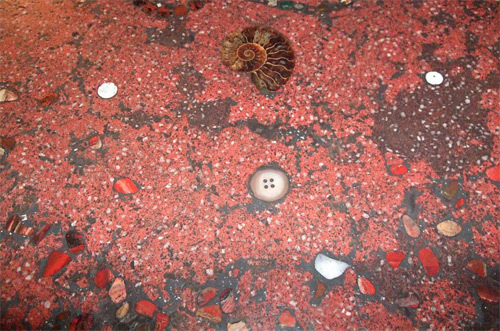 The oldest methods of adding glitter to concrete are shiny aggregates - mica, glass, bits of mirror and so forth. More recent additives include silica carbide, spar, and "pixie dust" made of small glass beads.